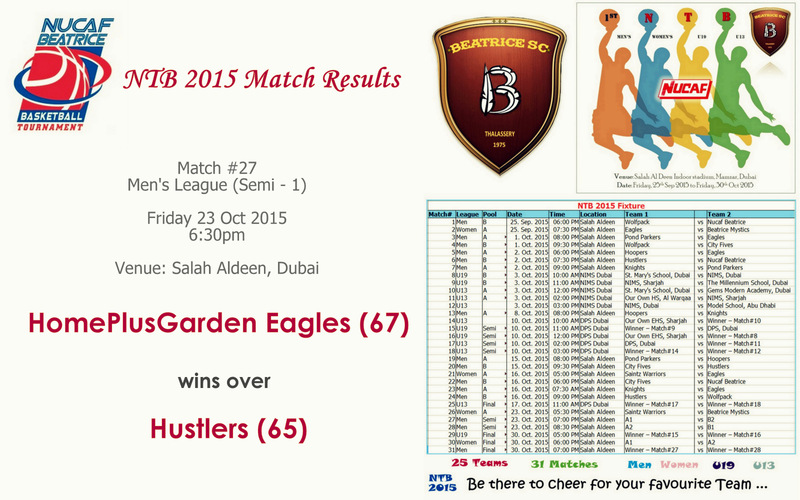 This entry was posted in 2015, Basket Ball, Dubai, NTB2015, Top Stories, Tournaments and tagged Basketball, Beatrice Dubai, Dubai, NTB, Salah Aldeen, Tournament. 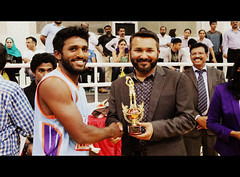 Nucaf Beatrice bagged the Runners Up trophy in the recently concluded 10th Indian Basketball League, one of the most prestigious tournaments in UAE, organized by the Indian Basketball Society. The inclusion of new members like Aaron Fernes, Ishan Shoukath, Ahraz Asad, Satyajit Kulkarni and Hanan Nisar provided the much needed youth and energy to our experienced line up and the change was evident in the performance. The campaign started with a close loss to Knights and an even closer loss to Hoopers. But we came back strong into the competition with a 25 points victory over Blue Bells and a thumping 9 points win over the much stronger City Fives. With this we stormed into the semi final to set up a clash with 7 time champions All Stars. In what turned out to be the most thrilling match of the tournament, we dethroned All Stars in an emphatic manner. The entire stadium was in shock when the final whistle was blown. In the final, our boys started slowly which helped Knights to get a comfortable lead in the first quarter and concentrate more on defense later. Though we came up with better plays and better scoring in the last quarter, we could only bring the score closer and not effect a win. Aaron, with his unbelievable dribbling skills, made inroads through the opponents’ defense at will throughout the tournament. Ishan, with his unmatched ball handling and excellent assists and Ahraz with his fearless drive ins, captured the hearts of all basketball lovers. Shijas proved his worth in crucial moments. 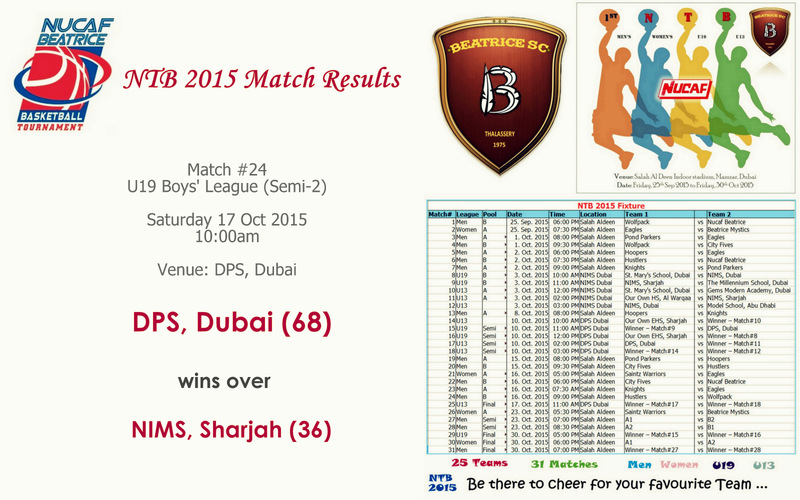 Anil Tom, Shabeer and Satya provided strong defense while Zaheer and Hanan were good in long range shooting. 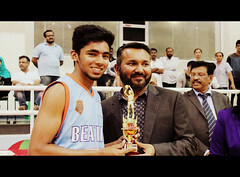 Aaron Fernes was awarded the Top Scorer of the tournament and Ishan Shoukath was the Most Promising Player of the tournament. The team: Joseph Thomas, Siddique Oliyath, Zaheer Abbas, Prince Paul, Shabeer, Anil Tom, Mohammed Shijas, Javad, Muzammil, Aaron Fernes, Ishan Shoukath, Ahraz Asad, Hanan Nisar and Satyajit Kulkarni. The coach was Abraham Cheeran and the manager Joepaul. This entry was posted in 2015, Basket Ball, Dubai, Top Stories and tagged Basket Ball, Basketball, Beatrice Dubai, Beatrice Sports Club, Dubai, IBS League, Middle East, Runner-up, UAE, United Arab Emirates. 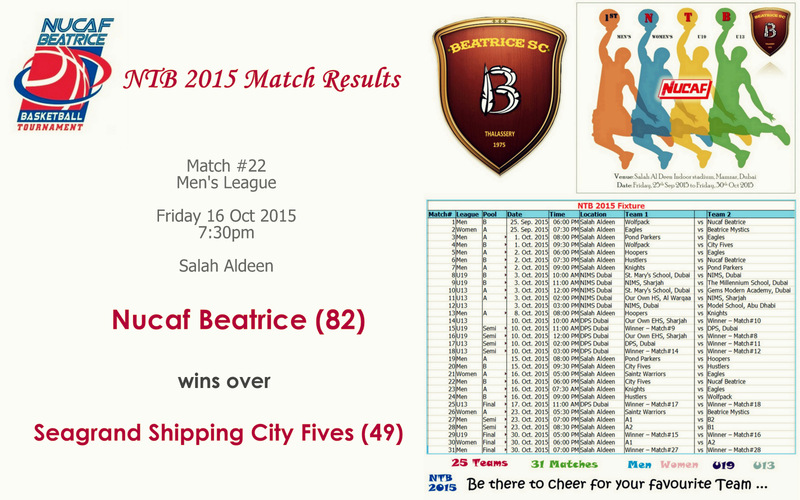 Beatrice who started as an underdog at the IBS League 2015 played some extra ordinary game to reach the Semi-Finals of the league to face the 5 times and running Champion All Stars. It was a match which created history when Beatrice defeated All Stars to reach the finals of the prestigious IBS League 2015. 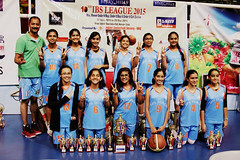 This entry was posted in 2015, Basket Ball, Dubai, Top Stories and tagged Basket Ball, Basketball, Beatrice Dubai, Dubai, IBS League, Middle East, United Arab Emirates. THe 66 Republic Day Cup between Coorg and Beatrice ended up with Coorg 3 goals Beactrice 2 goals. It was an amazing game played by Beatrice XI Players. Hearty Congratulations to all the wonderful players of Beatrice. Special thanks to the seniors and the young talents of Beatrice like Rafshid and others. Please join me in congratulating the whole team for the wonderful performance during the match. To Commemorate the 66th Republic Day of India and the 60th Year of Indo-Oman Diplomatic Ties Team Coorg & Friends of Naqvi Group cordially invite you to A Festival of Hokey Matches. This entry was posted in 2015, Hockey, Muscat, Top Stories and tagged Hockey, Middle East, Muscat Oman, Oman, Sultan Qaboos Sports Complex, Team Coorg.